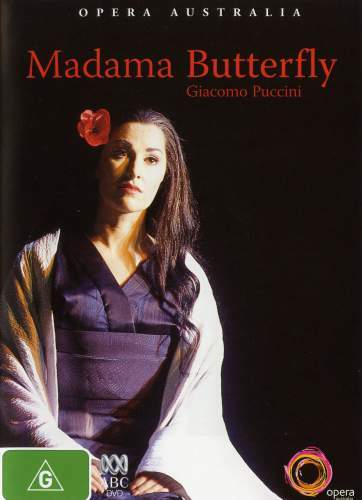 ��� Madama Butterfly originally premiered in 1904 in a two act version. It was not a success. Puccini revised the opera into a three act version later the same year, and this time it was a major success. While the opera is Italian and the setting is Japan, it was based on a play produced by the American David Belasco, based on a short story by John Luther Long. As such it contains little genuine Japanese flavour. This production by Opera�Australia was staged at the Sydney Opera House in 1997, and also has little Japanese flavour to it. The only part of the stage and costume design which appeared idiomatic was the half-Western costume worn by Goro the marriage broker. ��� The story is very simple. An American naval Lieutenant, Benjamin Franklin Pinkerton, has an arranged marriage with Cio-Cio-San, a 15-year old geisha who is also known as Madame Butterfly. While Pinkerton considers the marriage a sham which he can walk away from when he has taken what he wants, Butterfly believes it to be genuine. Pinkerton ignores the counsel of the consul Sharpless, who can see that Butterfly takes the marriage more seriously than the American. Soon after the marriage Pinkerton leaves aboard his naval ship, with empty promises to return. Tragedy ensues, as it often does. ��� This production stars Cheryl Barker in the title role. Ms Barker, as some would remember, sang Mimi in the original Baz Luhrmann production of La Boheme. With her husband Peter Coleman-Wright she has carved out a career on the stage in both her native Australia and in Europe. She has a good voice and can act, though in this performance she overdoes the girlishness of the character, something that the close-up view of the television lens emphasises. Pinkerton is sung by the American Jay Hunter Morris, who is quite good as an actor and is well cast in that respect. An assessment of the quality of his voice is difficult given the audio quality of this DVD (see below for details). There is good support by the singers in the minor roles. ��� The conducting is workmanlike but rarely inspirational. Puccini's big tunes are well served but the overall effect is a little bland. This is not helped by the video direction, with too many close-ups which mean that some of the stage effects are missed. Unfortunately, even if you are a fan of this particular production and don't mind the inadequacies of the video version, the quality of the recording leaves much to be desired. ��� The production is shown in what appears to have been the original aspect ratio of 1.78:1, but it is not 16x9 enhanced. There is a disclaimer on the case that allowances need to be made for both video and audio due to the age of the material, but this recording is less than 9 years old. ��� The video quality is poor by comparison to other video recordings of a similar vintage. There is little in the way of fine detail even in close up. Colours are generally muted and lacking in vividness. Shadow detail is poor, though nothing is missed as a result. ��� There is some low level noise and chroma noise, though nothing especially distracting. There are no film artefacts given that this is a video production. ��� Optional subtitles in yellow font are provided. These are easy to read, with no errors or omissions. Unfortunately they are not 16x9 friendly. Where the subtitles extend to two lines, the top line is placed no higher than across the border of the video frame. This means that if you zoom the image to fill the entire display the subtitles are not visible. ��� The disc is RSDL-formatted with the layer change perfectly placed at 54:10 during the break between Acts 1 and 2. ��� The only audio track provided is in Dolby Digital 2.0 stereo, which is by no means the best option for a music DVD. I would have much preferred a Linear PCM track. There is no surround encoding. ��� I expect that the shortcomings of the audio presentation are due to the compression down to 384 K/bps. There is a metallic-sounding edge to the voices which particularly affects the tenor, so that it is very difficult to listen to his singing. The baritone of Sharpless is also affected by this distortion, but Barker's voice is relatively unscathed. Even so there is not the richness and depth that would be associated with a higher bitrate. ��� The orchestral sound is also slightly distorted, especially the strings which seem to be accompanied by a hiss. Stage sounds, often a problem in some live recordings, are not intrusive. There is considerable reverberation at times, the acoustic sounding boxy, though this is noticeable mainly during the first act. ��� Overall the audio is disappointing. ��� The only extra is a four-page booklet which contains a plot synopsis and cast and crew credits. ��� As far as I can tell this performance is only available on DVD in Region 4. ��� This is a good performance of the opera which doesn't rise to any great heights. Unfortunately the video and audio quality of the DVD are not up to par, and on that basis I cannot recommend it. There are several other performances of the opera on DVD, both live and filmed with lip-syncing, and just about any of these would have better sound and image. Display Sony 86CM Trinitron Wega KVHR36M31. Calibrated with Ultimate DVD Platinum. This display device is 16x9 capable. Audio Decoder Built in to DVD player, Dolby Digital, dts and DVD-Audio. Calibrated with Ultimate DVD Platinum.